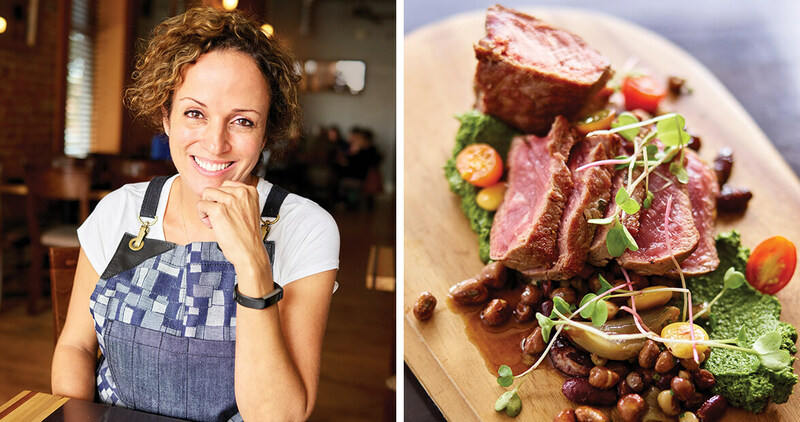 At a former hardware store in Asheboro, a new set of tools are on display: Chef Bia Rich builds her gourmet menu using passion, creativity, and flavors from near and far. Early in the morning, Bia Rich stands in front of the industrial-size refrigerator in her restaurant’s kitchen, taking a mental inventory of its contents. Her gaze dances from the broccoli rabe to the olives to the goat cheese to the fresh greens. On the counter sits the duck she just butchered and a whole Scottish salmon she just filleted. She has an idea of what she’d like to make, but she doesn’t have a recipe, only a pumpkin cashew curry sauce simmering on the stove. Another glance at the refrigerator shelves before her, and a daily special is born: Scottish salmon with broccoli rabe pesto, pumpkin cashew curry, and jasmine rice. Depending on her mood and the ingredients on hand, the day’s special might be rack of lamb with roasted eggplant, fingerling potatoes, cured tomatoes, fennel, and rich licorice bordelaise, or triggerfish with black turtle beans, leeks, fried green tomatoes, and spicy red chili butter. Thanks to Bia’s Gourmet Hardware, folks in Asheboro and beyond have gotten used to the taste of the extraordinary in the seemingly ordinary. Bia’s path to her own restaurant had as many twists as her signature dark locks. She grew up in Brazil, the youngest of six sisters, soaking up the flurry of activity in her mother’s kitchen. But it was when she came to New York as an exchange student in high school that her culinary horizons began to expand. What followed was 17 years of managing a restaurant and personal cheffing on the side, a brief stint at culinary school, and months spent learning about wine and food in Europe. 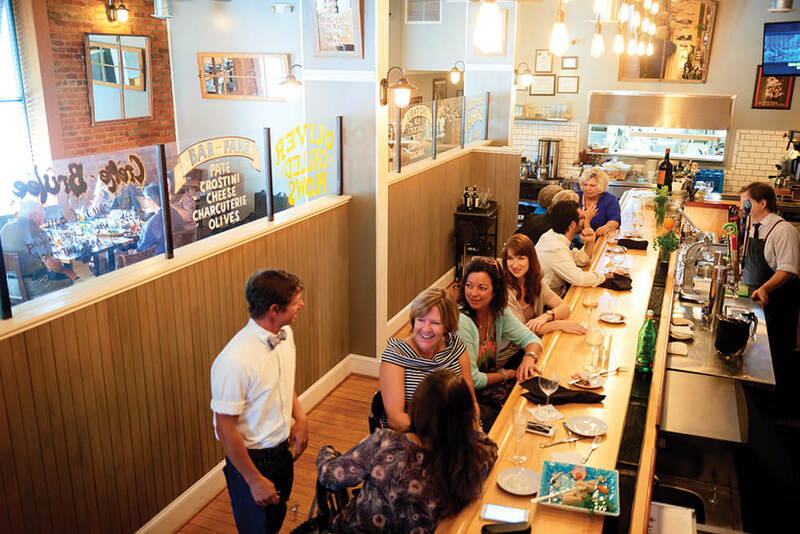 Bia finally realized her dream of owning a restaurant — this one, near co-owner Eric Rich’s family in North Carolina, in the former McCrary-Redding hardware store on the corner of Worth and Fayetteville streets. Eric and his father spent a year returning the early 1900s building to its former glory. Today, the dining room — featuring exposed brick, ductwork along the vaulted ceiling, and waitstaff wearing thick shop aprons — is a celebration of the building’s history. If it weren’t for the chalkboard sign with the day’s specials out front, you might walk in thinking you could buy a hammer and a bag of nails. At lunchtime, patrons settle in at bare tables — no white tablecloths here — or at the bar, where they sneak a peek through the service window at the action in the kitchen. There, Bia and her new chef de cuisine, Graham Heaton — who started Table 16 restaurant in Greensboro and has returned to the kitchen after a year’s sabbatical — reduce, sauté, and season their take on New American cuisine, all from scratch. Bia brings her love of South American flavors and culinary vision to dishes featuring pheasant, bison, and swordfish, alongside Heaton’s interpretations of chiles rellenos or mole tostones. The flavors may be exotic, yet their origins are anything but. The produce and proteins are sourced from local farmers: Pisgah microgreens. Franklinville cheese. Asheville bison, Goldsboro pork, Morehead City oysters. Plus the occasional Scottish salmon. Dishes center on what produce is available each season — or even each month. For patrons whose tastes aren’t quite as adventurous, there are plenty of options with a North Carolina twist, including pimento cheese fondue, fried green tomatoes, chèvre grits, and summer squash with mozzarella. For proof, try the seafood bouillabaisse: a menagerie of seafood — clams, rock shrimp, salmon, blue crab — bathed in a saffron-red pepper broth and served over fragrant rice. Or the four-star Wagyu rib eye — a simple dish, until Bia opens the fridge to add creamed sweet corn, heirloom tomatoes, roasted shallots, and thyme steak sauce. Still not convinced? Check out the small-plates menu: roasted bone marrow, vegetable ceviche, prosciutto-wrapped fried pimento cheese, or a venison lollipop with heirloom bean mash. Over at the bar, Eric creates drinks as eclectic and visionary as Bia’s dishes. 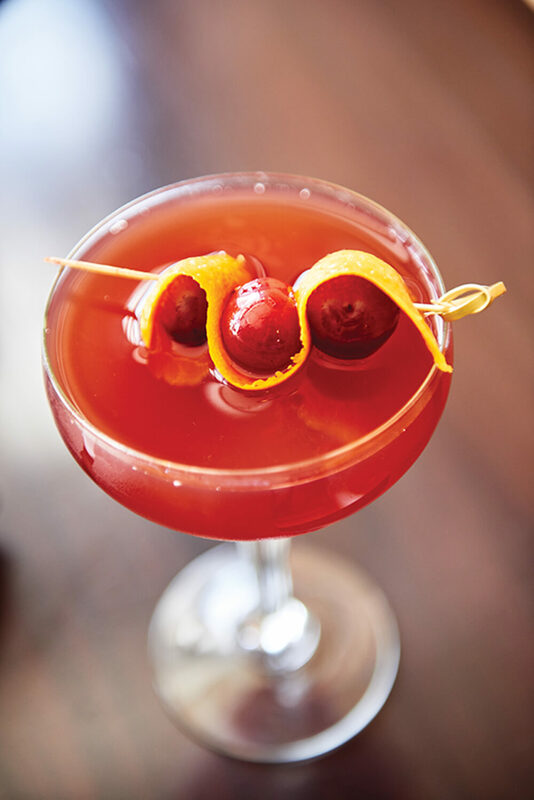 His menu of signature cocktails include The Table Saw, The Pipe Cutter, and The Hatchet — classic drinks with a Rich twist. Along with fresh-squeezed orange juice and vodka, his take on a screwdriver contains basil simple syrup and St. Germain elderflower liqueur. The day is winding down, and Bia’s is still buzzing. The last diners are reluctant to leave. At one table, a bearded man wearing cutoffs and a Pink Floyd T-shirt is piling escargot and country ham onto a piece of toast while sipping Le Charmel Rosé from Côtes de Provence. A table away, a woman in a little black dress and heels dives into a burger, fries, and a Potter’s Clay Amber Ale from Four Saints Brewery down the street. Looking at the menu, people often think they’re required to wear their Sunday best to dine at Bia’s, but the owners insist that’s not the case. Maybe that’s why word has traveled so quickly about the restaurant. At the center of it all, Bia’s passion for discovering and sharing new flavors shines.